Insulin-like growth factors (IGFs), IGF binding proteins (IGFBPs) and angiopoietin-like proteins (ANGPTLs) can enhance the ex vivo expansion of hematopoietic stem cells (HSCs) when used with a standard cytokine cocktail of stem cell factor (SCF), thrombopoietin (TPO) and FLT3 ligand (FL). In order to determine the optimal dose and combination of IGFs, IGFBPs and ANGPTLs, serial dilution and full permutation of IGFBP1, IGFBP2, IGF2 and ANGPTL3 were applied on a cryopreserved umbilical cord blood mononuclear cell (UCB-MNC) ex vivo expansion system. In this system, 4 × 105 cells/ml of UCB-MNCs were inoculated in serum-free Stemspan® medium (Stemcell technologies, vancouver, BC, Canada) supplied with standard basal cytokine combination of 100 ng/ml SCF, 50 ng/ml FL and 100 ng/ml TPO and supported by a bone marrow mesenchymal stromal cell layer. Paradoxically, experiment results showed that the highest expansion of CD34+CD38−CD90+ primitive progenitor was stimulated by cytokine combination of SCF + TPO + FL + IGFBP1 + IGFBP2 + ANGPTL3 at a low dose of 15 ng/ml IGFBP1 and 20 ng/ml IGFBP2 and ANGPTL3. This ex vivo expansion was further validated in 8-week-old to 10-week-old nonobese diabetic/severe combined immunodeficiency interleukin 2 gamma chain null (NOD/SCID-IL2Rγ−/−) mice. Limiting dilution assay showed excellent correlation between the HSC ex vivo surface marker of CD34+CD38−CD90+ and the in vivo competitive repopulating unit (CRU) functional assay. IGFBP1, IGFBP2, IGF2 and ANGPTL3 can stimulate the expansion of CD34+CD38−CD90+ primitive progenitor at low dose. The optimal combination comprises IGFBP1, IGFBP2 and ANGPTL3 together with the standard cytokine cocktail of SCF, FL and TPO. The CD34+CD38−CD90+ phenotype can serve as a surrogate ex vivo surface marker for HSCs due to consistency with the in vivo CRU functional assay. Ex vivo expansion of umbilical cord blood (UCB) hematopoietic stem cells (HSCs) may overcome the obstacle of low cell dose for UCB transplantation in adults. Insulin-like growth factors (IGFs), insulin-like growth factor binding proteins (IGFBPs) and angiopoietin-like proteins (ANGPTLs) have been described previously to help enhance ex vivo expansion of HSCs when used with a standard cytokine cocktail of stem cell factor (SCF), thrombopoietin (TPO) and FLT3 ligand (FL) [1–10]. ANGPTLs and IGFBPs have also been demonstrated to enhance HSC in vivo migration and activity, supporting survival and replating capacity [11–14]. However, the optimal dose and combination of these novel cytokines have yet to be determined. Current doses of IGFBPs and ANGPTLs are in the range of 100 to 500 ng/ml. In terms of clinical application, these concentrations may not be optimal and would be costly. Hence, investigations into the optimal cytokine dose and combination of IGFs, IGFBPs and ANGPTLs are important. 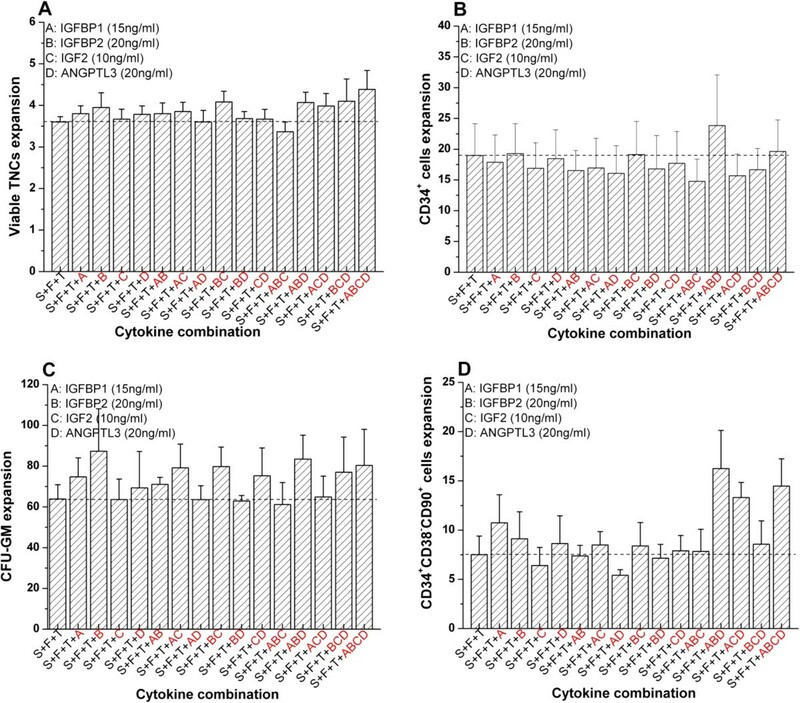 In this study, serial dilution and full permutation were used to determine the optimal cytokine dose and combination for stimulation of ex vivo expansion of UCB-HSCs. This established cytokine dose and combination were then further validated in 8-week-old to 10-week-old nonobese diabetic/severe combined immunodeficiency interleukin 2 receptor gamma chain null (NOD/SCID-IL2Rγ−/−; NSG) mice. Cryopreserved UCB was obtained from Singapore Cord Blood Bank. Bone marrow (BM) was obtained from Singapore General Hospital with the donor’s informed consent. The use of UCB and BM was reviewed and approved by the Institutional Review Boards of National University of Singapore, Singapore General Hospital as well as the Singapore Cord Blood Bank Research Advisory Ethics Committee (for UCB). Cryopreserved UCB was processed in Singapore Cord Blood Bank following the standard volume reduction and red blood cell depletion method. The characteristics of the UCBs employed in this study are summarized in Table 1. BM-derived mesenchymal stromal cell culture was obtained as described in our previous publication [15, 16]. Cryopreserved UCB mononuclear cells (4 × 105cells/ml) were suspended in serum-free Stemspan® medium (Stemcell technologies, vancouver, BC, Canada) supplied with a standard cytokine combination of 100 ng/ml SCF, 50 ng/ml FL and 100 ng/ml TPO (all three cytokines purchased from Peprotech, Rocky Hill, NJ, USA) and with individually varied doses and combinations of IGFBP1, IGFBP2, IGF2 and ANGPTL3 (these four cytokines purchased from R&D Systems, Minnneapolis, MN, USA). The cells were inoculated on a passage 3 to 5 BM-derived mesenchymal stromal cell layer and cultured in 37°C incubator for 12 days. The expanded cells were harvested at the end of 12 days and the adherent cord blood cells were detached after 1 minute of incubation at room temperature with 0.25% trypsin–ethylenediamine tetraacetic acid. All data were acquired using the cytomics FC500 flow cytometer (Beckman Coulter, Inc., Miami, FL, USA) and 10,000 events per sample were collected. Cell viability (AnnV/7AAD), hematopoietic primitive progenitors (CD34/CD38/CD90) of unexpanded and ex vivo expanded UCB and human cell multi-lineage reconstitution (CD45, CD34, CD71, CD15/66b, CD3 and CD19/20) in mice were analyzed using the same method mentioned in our previously published paper [15, 16]. Quantification of granulocyte–macrophage colony-forming units was performed before and after expansion. The method was similar to our previous publication [15, 16]. NSG mice were purchased from Jackson Laboratories (Klaine, USA) by SingHealth Experimental Medicine Centre and were maintained in the same facility. All animal experiments were performed under the approval of the SingHealth Institutional Animal Care and Use Committee. The unexpanded and expanded UCB with four different cytokine combinations, ‘SCF + TPO + FL’, ‘SCF + TPO + FL + IGFBP2’, ‘SCF + TPO + FL + IGFBP2 + IGF2 + ANGPTL3’ and ‘SCF + TPO + F + IGFBP1 + IGF2 + ANGPTL3’ at doses of 20 ng/ml IGFBP2 and ANGPTL3, 15 ng/ml IGFBP1 and 10 ng/ml IGF2, were injected intravenously via the tail vein into sublethally irradiated (240 cGy) 8-week-old to 10-week-old NSG mice. Acidified water and cyclosporine A were administered to NSG mice orally and by intraperitoneal injection for prophylaxis of bacterial and fungal infection and graft versus host disease. At the end of the fourth month of transplantation, the mice were sacrificed using a carbon dioxide chamber. The femur and tibia were harvested and placed into cold RPMI medium (Invitrogen, Grand Island, NY, USA) immediately. Joint ends were cut and BM was flushed out with 10 ml of 2% fetal bovine serum–RPMI. Subsequently, contaminated red blood cells were lysed by ammonium chloride-based buffer before flow cytometric analysis. The results are expressed as mean ± standard deviation. The significance between two groups was determined using the two-sample independent t test. P < 0.05 was defined as significant. In terms of multiple comparisons, Bonferroni’s test was used to correct the P value for the t test. The processing and statistical analysis of the data was performed using OriginPro 7.5 software (OriginPro, Inc., Northampton, MA, USA). When cryopreserved UCB mononuclear cells were cultured on a BM-derived mesenchymal stromal cell layer with the standard cytokine cocktail (100 ng/ml SCF, 50 ng/ml FL and 100 ng/ml TPO) plus individually varied doses of IGFBP1, IGFBP2, IGF2 and ANGPTL3, the highest expansion of CD34+CD38−CD90+ primitive progenitor appeared at a low dose of 20 ng/ml for IGFBP1, IGFBP2, IGF2 and ANGPTL3 (concentrations of 0, 20, 50, 100 and 200 ng/ml were studied) (Figure 1D). 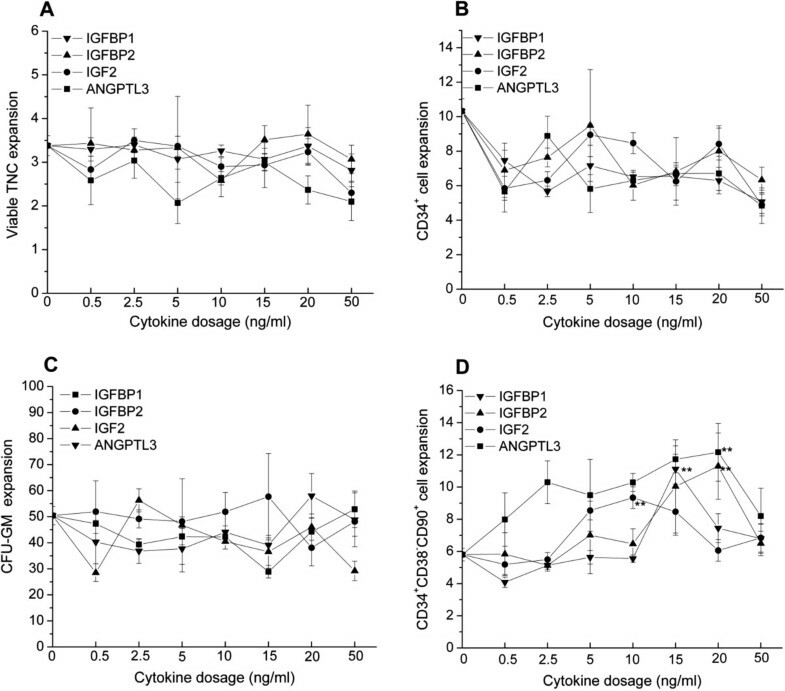 The expansion of total nucleated cells, CD34+ cells and granulocyte–macrophage colony-forming units decreased with increasing dose of cytokine (Figure 1A,B,C). Based on the above result, the range of cytokine dose was further narrowed to 0 to 50 ng/ml. 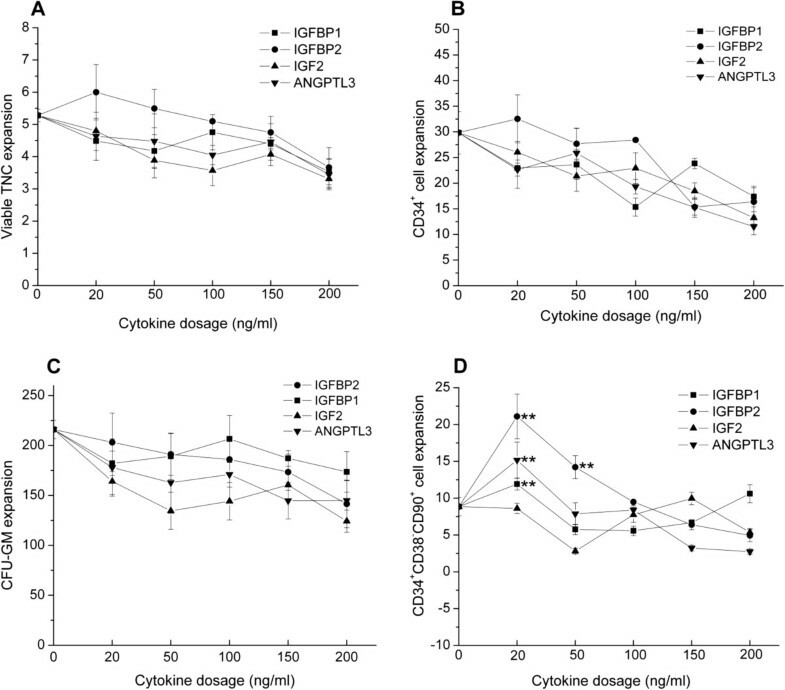 The optimal cytokine dose was determined at 20 ng/ml IGFBP2 and ANGPTL3, 15 ng/ml IGFBP1 and 10 ng/ml IGF2 when maximal expansion of CD34+CD38−CD90+ primitive progenitor was reached, which was significantly higher than standard cytokine combination (P = 0.01) (Figure 2D). Similarly, these four novel cytokines did not contribute to the expansion of total nucleated cells, CD34+ cells and granulocyte–macrophage colony-forming units (Figure 2A,B,C). IGFBP1, IGFBP2, IGF2 and ANGPTL3 stimulate the ex vivo expansion of CD34 + CD38 − CD90 + primitive progenitors at low dose. Post-thaw umbilical cord blood cells (4 × 105 cells/ml) were suspended in serum-free Stemspan® media (Stemcell technologies, vancouver, BC, Canada) supplied with different doses of indicated cytokines in the range 0 to 200 ng/ml and standard cytokine combinations of 100 ng/ml stem cell factor, 50 ng/ml FLT3 ligand and 100 ng/ml thrombopoietin, inoculated on a passage 3 to 5 bone marrow-derived mesenchymal stromal cell layer in a 24-well plate and cultured for 12 days. (A) Expansion of viable total nucleated cells (TNCs). (B) Expansion of CD34+ cells. (C) Expansion of granulocyte–macrophage colony-forming units (CFU-GM). (D) Expansion of CD34+CD38−CD90+ cells. Results expressed as mean ± standard deviation. For each novel cytokine, a t test was performed between the variant cytokine dosage group and baseline (standard cytokine combination). **P < 0.01. ANGPTL, angiopoietin-like protein; IGF, insulin-like growth factor; IGFBP, insulin-like growth factor binding protein. Optimal dose of IGFBP1, IGFBP2, IGF2 and ANGPTL3 was established from 10 to 20 ng/ml. Post-thaw umbilical cord blood cells (4 × 105 cells/ml) were suspended in serum-free Stemspan® media (Stemcell technologies, vancouver, BC, Canada) supplied with different doses of indicated cytokines in the range 0 to 50 ng/ml and standard cytokine combinations of 100 ng/ml stem cell factor, 50 ng/ml FLT3 ligand and 100 ng/ml thrombopoietin, inoculated on a passage 3 to 5 bone marrow-derived mesenchymal stromal cell layer in a 24-well plate and cultured for 12 days. (A) Expansion of viable total nucleated cells (TNCs). (B) Expansion of CD34+ cells. (C) Expansion of granulocyte–macrophage colony-forming units (CFU-GM). (D) Expansion of CD34+CD38−CD90+ cells. Results expressed as mean ± standard deviation. For each novel cytokine, the t test was performed between the variant cytokine dosage group and baseline (standard cytokine combination). **P < 0.01. ANGPTL, angiopoietin-like protein; IGF, insulin-like growth factor; IGFBP, insulin-like growth factor binding protein. To determine the optimal cytokine combination, complete permutation was carried out after establishing the optimal dose of each cytokine. The combination ‘SCF + TPO + FL + IGFBP1 + IGFBP2 + ANGPTL3’ had superior expansion of CD34+CD38−CD90+ primitive progenitor (16.3 ± 3.9-fold versus 7.5 ± 1.9-fold with standard cytokine cocktail) compared with all other combinations (Figure 3D). Similarly, despite promoting expansion of CD34+CD38−CD90+ primitive cells, there was no further enhancement of expansion of total cells and general progenitors compared with control (Figure 3A,B,C), suggesting that this cytokine cocktail only enhanced the earlier progenitors. Hence, representative cytokine cocktails of ‘SCF + TPO + FL’, ‘SCF + TPO + FL + IGFBP2’, ‘SCF + TPO + FL + IGFBP2 + IGF2 + ANGPTL3’ and ‘SCF + TPO + FL + IGFBP1 + IGFBP2 + ANGPTL3’ were chosen for further validation in NSG mice. ‘SCF + TPO + FL + IGFBP1 + IGFBP2 + ANGPTL3’ is the optimal cytokine combination to enhance ex vivo expansion of CD34 + CD38 − CD90 + primitive progenitor cells. Post-thaw umbilical cord blood cells (4 × 105 cells/ml) were suspended in serum-free Stemspan® media (Stemcell technologies, vancouver, BC, Canada) supplied with different cytokine combinations with optimal doses and standard cytokine combinations of 100 ng/ml stem cell factor (S), 50 ng/ml FLT3 ligand (F) and 100 ng/ml thrombopoietin (T), inoculated on a passage 3 to 5 bone marrow-derived mesenchymal stromal cell layer in a 24-well plate and cultured for 12 days. Here, the optimal dose of IGFBP1 (A), IGFBP2 (B), IGF2 (C) and ANGPTL3 (D) was 15 ng/ml, 20 ng/ml, 10 ng/ml and 20 ng/ml respectively. (A) Expansion of viable total nucleated cells (TNCs). (B) Expansion of CD34+ cells. (C) Expansion of granulocyte–macrophage colony-forming units (CFU-GM). (D) Expansion of CD34+CD38−CD90+ cells. Results expressed as mean ± standard error (cord blood unit number, n = 6). ANGPTL, angiopoietin-like protein; IGF, insulin-like growth factor; IGFBP, insulin-like growth factor binding protein. NSG repopulation assays were performed to determine whether the ex vivo expanded cells were capable of long-term hematopoiesis. Thus, 5 × 105 and 1 × 106 unexpanded cells and 1 × 106 and 2 × 106 expanded cells with four cytokine combinations of ‘SCF + TPO + FL’, ‘SCF + TPO + FL + IGFBP2’, ‘SCF + TPO + FL + IGFBP2 + IGF2 + ANGPTL3’ and ‘SCF + TPO + FL + IGFBP1 + IGFBP2 + ANGPTL3’ were transplanted to irradiated NSG mice. The results did not demonstrate any significant difference in the human cell long-term engraftment when the mice received UCB expanded with cytokine combinations of ‘SCF + TPO + FL’, ‘SCF + TPO + FL + IGFBP2’, ‘SCF + TPO + FL + IGFBP2 + IGF2 + ANGPTL3’ and ‘SCF + TPO + FL + IGFBP1 + IGFBP2 + ANGPTL3’ compared with unexpanded UCB (P < 0.05; Figure 4A). This means that the stem cell repopulation properties were not lost during the ex vivo expansion. In addition, representative mice that received 2 × 106 expanded cells cultured with the cytokine combination ‘SCF + FL + TPO + IGFBP1 + IGFBP2 + ANGPTL3’ displayed an equivalent multi-lineage differentiation capacity of primitive human cells (CD34+, 0.26 ± 0.11%), myeloid cells (CD45+CD71+, 0.2 ± 0.08%; CD15/66b+, 0.16 ± 0.07%), B-lymphoid cells (CD19/20+, 0.87 ± 0.56%) and T-lymphoid cells (CD3+, 0.01 ± 0.001%) to mice that received 0.5 × 106 unexpanded cells of 0.36 ± 0.23%, 0.52 ± 0.32%, 0.47 ± 0.36%, 0.47 ± 0.27% and 2.15 ± 0.82% (P = 0.81, P = 0.58, P = 0.64, P = 0.50 and P = 0.15; Figure 4B). For T-lymphoid cell differentiation, even though there was no significant difference between expanded units and unexpanded units from statistical analysis, from direct observation we could say that the unexpanded unit was better than the expanded unit. Human cell engraftment and multi-lineage reconstitution profile. (A) Amount of human chimerism in the bone marrow of NOD/SCID-IL2Rγ−/−mice that received a transplant of 5 × 105 and 1 × 106 unexpanded human mononuclear cord blood cells and 1 × 106 and 2 × 106 expanded progeny cells. Each symbol represents the engraftment of a single mouse that underwent transplantation assayed at 4 months post transplantation. (B) Summary of multi-lineage reconstitution from mice bone marrow transplanted 5 × 105 unexpanded cells in lane 1 and transplanted 2 × 106 expanded cells with the cytokine combination ‘S + F + T + ABD’ in lane 10 of (A). S, stem cell factor; F, FLT3 ligand; T, thrombopoietin. A, IGFBP1; B, IGFBP2; C, IGF2; D, ANGPTL3. ANGPTL, angiopoietin-like protein; IGF, insulin-like growth factor; IGFBP, insulin-like growth factor binding protein. After 4 months of transplantation, the limiting dilution assay showed that the competitive repopulating unit (CRU) was 1/1.53 × 106, 1/1.6 × 106, 1/1.4 × 106 and 1/1.2 × 106 in the expanded cells cultured with cytokine combinations of ‘SCF + TPO + FL’, ‘SCF + TPO + FL + IGFBP2’, ‘SCF + TPO + FL + IGFBP2 + IGF2 + ANGPTL3’ and ‘SCF + TPO + FL + IGFBP1 + IGFBP2 + ANGPTL3’ compared with 1/6.1 × 105 in the unexpanded cells when P < 0.05 (Figure 5A). There was thus 4.4-fold, 4.3-fold, 4.5-fold and 6.4-fold in vivo expansion of long-term HSCs based on calculation according to the viable total nucleated cell expansion (Figure 5B, lane 1). There was 6.4 ± 0.2-fold, 6.0 ± 0.1-fold, 6.8 ± 0.2-fold and 8.8 ± 0.5-fold ex vivo expansion of CD34+CD38−CD90+ cells according to these four cytokine combinations (Figure 5B, lane 4). Strangely, there is always a close ratio of 69.8 ± 2.9% between in vivo expansion of the CRU and ex vivo expansion of CD34+CD38−CD90+ cells in different cytokine combinations (Figure 5C). The excellent correlation between the HSC ex vivo surface marker of CD34+CD38−CD90+ and the in vivo CRU functional assay indicate that phenotypic combination of CD34+CD38−CD90+ can be used as an HSC ex vivo detecting biomarker. Cytokine combination of ‘SCF + TPO + FL + IGFBP1 + IGFBP2 + ANGPTL3’ stimulates highest ex vivo expansion of primitive progenitors as assayed in NOD/SCID-IL2Rγ −/− mice. (A) Limiting dilution assay for the unexpanded and expanded cells. Negative engraftment was defined by less than 0.5% of human CD45+ cell engraftment in mice bone marrow (P < 0.05). (B) Ex vivo expansion of umbilical cord blood (UCB) cells. 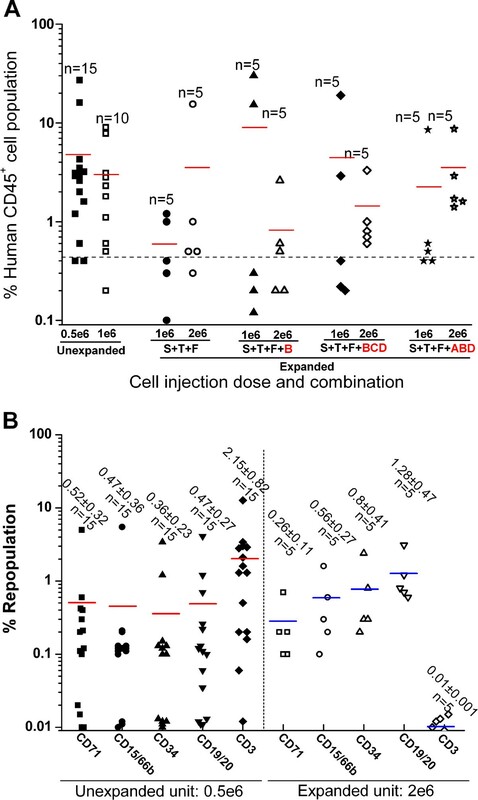 Post-thaw UCB cells (4 × 105 cells/ml) were suspended in serum-free Stemspan® media (Stemcell technologies, vancouver, BC, Canada) supplied with cytokine combinations of ‘S + T + F’,’ S + T + F + B’,’ S + T + F + BCD’ and ‘S + T + F + ABD’ respectively, inoculated on a passage 3 to 5 bone marrow-derived mesenchymal stromal cell layer in a T175 flask and cultured for 12 days. Here, the concentration of stem cell factor (S), FLT3 ligand (F), thrombopoietin (T), IGFBP1 (A), IGFBP2 (B), IGF2 (C) and ANGPTL3 (D) was 100 ng/ml, 50 ng/ml, 100 ng/ml, 15 ng/ml, 20 ng/ml, 10 ng/ml and 20 ng/ml respectively. (C) Correlation of in vivo competitive repopulating unit (CRU) functional assay and ex vivo CD34+CD38−CD90+ cell surface marker. Results expressed as mean ± standard deviation. For multiple comparisons, Bonferroni’s test was used to correct the P value for the t test. P < 0.05 → Pcorrected < 0.017 and P < 0.01 → Pcorrected < 0.003 when n = 3. *P < 0.05, **P < 0.01. ANGPTL, angiopoietin-like protein; CFU-GM, granulocyte–macrophage colony-forming units; IGF, insulin-like growth factor; IGFBP, insulin-like growth factor binding protein; TNC, total nucleated cell. In this study, IGFBP1, IGFBP2, IGF2 and ANGPTL3 have been demonstrated to stimulate ex vivo expansion of CD34+CD38−CD90+ primitive progenitor at a low dose of 15 ng/ml IGFBP1, 10 ng/ml IGF2 and 20 ng/ml IGFBP2 and ANGPTL3. The optimal cytokine combination comprises IGFBP1, IGFBP2 and ANGPTL3 together with the standard cytokine cocktail of SCF, FL and TPO. In view of the excellent correlation between the HSC ex vivo surface marker of CD34+CD38−CD90+ and the in vivo CRU functional assay, the CD34+CD38−CD90+ phenotype can serve as an ex vivo surrogate surface marker for HSCs. We showed that IGFBP1, IGFBP2, IGF2 and ANGPTL3 could stimulate the ex vivo expansion of HSCs or primitive progenitors rather than common progenitors and total cells, in agreement with recent reports [4, 6, 7, 9, 10]. However, this stimulation had a negative correlation to cytokine dose, where a high dose of cytokine induced low expansion of primitive progenitors. In fact, the optimal cytokine dose appeared at the lower range of 10 to 20 ng/ml. Compared with 100 to 500 ng/ml high-dose cytokine usage, this 10 to 20 ng/ml low dose will help to dramatically reduce the cost in clinical applications. In addition, our data also showed that an expanded unit with the established optimal cytokine cocktail of ‘SCF + TPO + FL + IGFBP1 + IGFBP2 + ANGPTL3’ had the capacity of multi-lineage reconstitution except for T-lymphoid cells. Even though the statistical analysis showed that there was no significant difference on T-lymphoid cell differentiation between expanded units and unexpanded units, T-lymphoid reconstitution capacity from the unexpanded unit was better than from the expanded unit by direct observation. The explanation for this phenomenon could be due to the cytokine cocktail used in ex vivo expansion to drive cultured cells to expand and differentiate into the myeloid lineage rather than the T-lymphoid lineage (data not shown). This defect can be overcome by double cord blood transplantation with one expanded unit and one unexpanded unit as demonstrated in our previous publication [15, 16]. From the limiting dilution assay, we know that only about 70% of expanded CD34+CD38−CD90+ primitive progenitors will reconstitute in NSG mice. What then happens to that 30% of expanded CD34+CD38−CD90+ primitive progenitors? 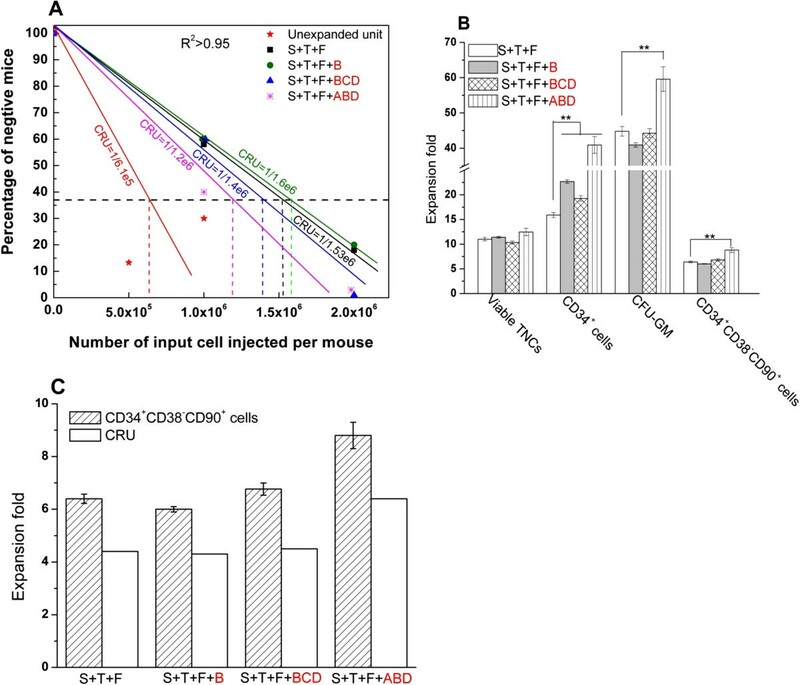 We postulate two possibilities; the first is that 30% of expanded CD34+CD38−CD90+ primitive progenitors lose their in vivo reconstitution capacity during ex vivo expansion even though they express the biomarker phenotypically, while the second possibility could be that 70% of expanded CD34+CD38−CD90+ primitive progenitors possess self-renewal, pluripotency and long-term reconstitution capacity, whereas only 30% of them have short-term hematopoietic reconstitution capacity. IGFBP1, IGFBP2, IGF2 and ANGPTL3 can stimulate ex vivo expansion of CD34+CD38−CD90+ primitive progenitor at low dose with the optimal cytokine combination comprising IGFBP1, IGFBP2 and ANGPTL3 together with the standard cytokine cocktail of SCF, FL and TPO. The CD34+CD38−CD90+ phenotype can serve as a surrogate ex vivo surface marker for HSC detection due to consistency with the in vivo CRU functional assay. The authors thank Bryan and Zheng Lin, staff of SingHealth Experimental Medicine Centre, for help with mice work. This work was supported by a Cancer Syndicate Grant (grant number SCS-T0049) and a Central Grant (NMRC/CG/SGH/2010). XF was involved in conception of the study, experimental design, data interpretation, and drafting and revising the manuscript. FPHG and JMLA helped to carry out the colony-forming assay, flow cytometric assay and animal sample acquisition, and drafted the manuscript. FWIL provided suggestions and helped to revise the manuscript. PPYC and SB participated in the study design, data analysis and interpretation. WYKH had full access to all of the data in the study and takes responsibility for the integrity of the data and the accuracy of the data analysis. All authors read and approved the final manuscript.